Many people are surprised to discover that, in South Carolina, you must hire a South Carolina licensed attorney to handle your real estate closing. Our Supreme Court has made it clear that handling a real estate closing is the practice of law and requires the supervision of a licensed South Carolina attorney. The mechanics of working with both your attorney and your real estate agent can be confusing, so let’s identify the key functions of an attorney in the transaction, and what roles they serve in the process. When do I hire the attorney? As an attorney, we typically get included in the real estate closing process after the buyer or seller has signed the contract. Is this bad? Not necessarily. While there are many contractual items that are standard or “boiler plate,” often a party has a requirement that needs to be added to the contract. These range from simple items, such as a buyer requiring a survey, to more complex requirements, such as a buyer wanting to take possession of the property earlier than the closing date. Depending upon the complexity, it is better for the contract to be reviewed before signing. In general, if you are uncomfortable signing the contract because you do not understand it or part of it, hire your attorney before you sign the contract. What is the attorney going to do that my real estate agent is not going to do? The real estate attorney is going to coordinate the transactional part of your closing, especially on the buyer’s side. Several common responsibilities of the buyer’s attorney include obtaining title work, reviewing the title work to make sure that there are no outstanding title issues (i.e. unsatisfied liens, outstanding easements, or competing interests in the property), working with your lender (if you are getting a loan to purchase the property), and obtaining other paperwork and financial information needed for the transaction, such as the amount to be collected at closing for taxes, insurance and homeowner association dues, if applicable. The attorney, if a licensed title insurance agent, will also apply for and prepare the title insurance policy. South Carolina allows attorneys, if licensed to do so, to serve as title agents, provided that the relationship is disclosed to the buyer. The seller’s attorney will prepare the deed for the seller to sign transferring the property to the buyer, in addition to any supplemental documents needed for the transfer (i.e., drafting a certification of trust that confirms authorization of the trust to sell the property, if title to the real property is held by a trust). The seller’s attorney will also discuss any required disclosures that must be provided by the seller at closing, including whether the seller has received a capital gain from the sale of the property that must be reported to the State of South Carolina. There will be a closing package with a settlement statement to be reviewed and signed at closing. If you have a loan, there will be significantly more paperwork to go over and review with your attorney. Once all signed, the buyer’s attorney will handle the disbursement of the funds and make sure that the deed and mortgage are properly recorded with the register of deeds. Overall, you should expect that your attorney will handle the funds and the necessary paperwork to complete the transaction, and your real estate agent will handle aspects more closely related to the property itself (such as transfer of utilities and keys/gate codes, coordinating pest control inspections, etc.). 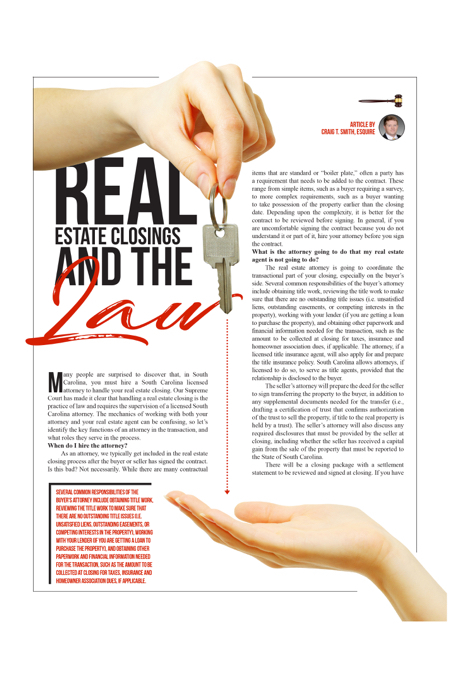 Are there other responsibilities that an attorney has in the closing process? Aside from representing the buyer, the buyer’s attorney typically serves as the closing (or settlement) agent, and oftentimes as the escrow agent. As escrow agent, the buyer’s attorney is responsible for holding the deposit paid at, or near, the time the contract is signed. In the event of a default by either party, the attorney must either deliver the deposit to the non-defaulting party upon a written agreement or release by each party, or—where an agreement cannot be reached—turn the proceeds over to the clerk of court’s office for resolution of the dispute in court. As closing/settlement agent, the attorney is responsible for coordinating wires to and from the parties, as well as from lenders. The attorney is also responsible for issuing payment to pay off outstanding mortgages. The attorney also coordinates the exchange of original documents on the day of closing with the office of the seller’s attorney. Isn’t the attorney going to cost me a fortune? I think I can speak for many of the local real estate attorneys when I say, “No, it is not.” Real estate is expensive. For many of us, buying or selling a piece of property might be the largest financial transaction in our lives. And what do real estate attorneys charge for ensuring that your interests are protected? The actual attorney fees can range from a few hundred to a few thousand dollars, depending upon the complexity of the issues. But on average, your attorney’s fee will be less than a thousand dollars. How can I find an attorney in South Carolina to help with my real estate closing? If you are purchasing or selling real estate in an area in which you do not know any real estate attorneys, your real estate agent or lender might be able to suggest an attorney to represent you. If not, the South Carolina Bar provides a free referral service for finding an attorney in your area. You can reach this service by calling (800) 868-2284, or by visiting scbar.org/public/get-legal-help/find-lawyer-or-mediator. Craig T. Smith is an associate attorney with Olivetti, McCray & Withrow. He represents buyers and sellers in residential and commercial real estate transactions. For more information, call (843) 341-9260 or visit omwlawfirm.com.